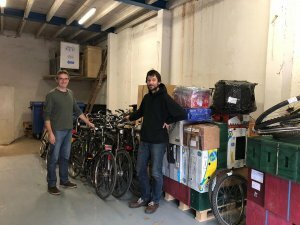 In March we were busy refurbishing 25 bicycles for an important collaboration with the municipality of Rotterdam and the Asylum Center of Beverwaard. 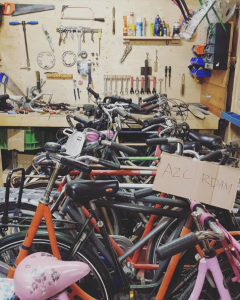 The asylum center already has an in-house bicycle workshop where people can learn to maintain, repair and refurbish old bicycles, however they were in need of further tools as well as functioning bicycles of direct use for the people living in the center. The bicycle can be a fast means of transport within Rotterdam, and can also help asylum seekers who have only recently arrived in the country familiarize themselves with the city. In September we collaborated with Betuwe Worldwide – Tools4Change foundation and together donated 10 refurbished bicycles to Hope Life International, an organization active in the village of Latrikunda Sabiji in The Gambia. This organization aims to help young people, women, orphans and people with disabilities gain skills in a number of vocational activities with the hopes of finding stable employment. The training ranges from administrative – IT skills building, to agrarian education and … bicycle mechanics! Our last project of the year took place in December and saw another collaboration with Betuwe Worldwide – Tools4Change foundation. This project involved 10 refurbished bicycles from our Rotterdam workshop being donated to Egoli, a Dutch foundation working in Uganda. Egoli is busy expanding their training center in Kisozi, where everyone is able to gain skills and education in a number of sectors including sewing, construction, agriculture and hairdressing. Bicycles are of essential use to Egoli in Kisozi. In the past, these have been used by members of the training center to transport newly constructed water tanks to schools in the region, and have supported the transport and sale of new school uniforms from the sewing participants.Their next step involves the construction of a bicycle workshop to support skills training in bicycle repair mechanics.